If you are an artist wishing to submit work for consideration, you are very welcome to do so, but you will have to approach this project with serious attention to the release requirements. Please provide all required information at the time of submitting your work. Because submitting to this label requires supplying more information than most other netlabels ask for, I’m providing a template you could choose to use during submittal. You don’t have to use it, but you do have to submit all the information on it. Album length should, in the best case scenario, be over twenty minutes, and under an hour. If you have a special idea that goes outside of that guideline, send me an email and we can discuss it. Submissions will be made in the release format of MP3 encoded at 320kbps. If you as artist and owner of your work wish to also release a FLAC or other format, you are welcome to do so on some other platform, such as BandCamp. I would ask for a link back to the release on this netlabel if you choose to do this. Do not submit any other file format than MP3 encoded at 320kbps. Please .zip or .rar your submission rather than send links to individual files. Files will be submitted by providing a link to a file, rather than emailing the file as an attachment. Any unsolicited attachments will be deleted without opening them. All submissions will be accompanied by an email with certain information described below. If you submit a Dropbox link (for example) without emailing, I will not know why you’ve sent it, and I may discard the link. ID3 tags. Please tag your work with artist / title / album title information. Cover art. Please provide cover art. The album cover art size should be 1425 pixels by 1425 pixels. If you wish to include more image files in your release, that is fine, but please let me know which image is the cover art. One helpful link when looking for cover art is Flickr, they have made searching for CC licensed images easy, so good on them! Here’s their CC search link: http://www.flickr.com/creativecommons/ Be sure to give proper attribution for imagery as you would for sound. Please include a link to your own website, so listeners can find you if they like your stuff. Please include tags that might describe your album. Think of tags as simple descriptors of components or aspects of the work rather than mere genres. If you want to include an artist statement, send it along… this isn’t mandatory. Having Derivative Netlabel release your work does not mean you remit your rights to the label. You maintain all rights over your work. Please note that all releases on Derivative Netlabel are provided to the audience for free, and no payment will be made by the label to the artist. The artist will provide licensing information for any work to be considered. You are free, as the artist, and owner of your work, to choose another license, but you will have to choose another netlabel, because this one will not release copyrighted or no-deriv recordings. I must say at this point that if you are basing your work on samples and you disallow anyone from sampling your stuff, that does seem really hypocritical to me, but hey, it’s your choice. If you are not familiar with how to pick a license, Creative Commons makes it easy with its license-wizard. Submit the license you choose in the email accompanying the download link to your work. All work released on this netlabel needs to be primarily based on appropriations (samples) from work that is licensed allowing derivative work. Let’s now unpack what I mean by this. By “primarily” I mean that the bulk of the sounds heard should originate from samples of one or more previously existing work(s). Other sounds may be used, but only used to fill out the sound, not as a focus of the work. I don’t really care about your guitar chops, I want to see how you use someone else’s guitar chops… I don’t care to hear you singing, I’d rather you re-cast someone else’s singing… and so on. This is very important: When you’re choosing work to sample from, it MUST be licensed to allow for sampling / adaptation. You will be expected to check all work for license BEFORE you sample it and base your work on it. Those licenses allowing derivative work are allowed, they are the same as those listed above under ‘License matters’: CC BY, CC BY SA, CC BY NC SA or Public Domain. If you find that the work is released under some other license such as Copyright, or any CC license containing the letters “ND” which stands for “no derivatives” you should not use it in your work if you wish to release on this label. Likewise, if no license is listed, we will assume restrictive license, it should not be used if you wish to release on this netlabel. The focus will be on releasing work that samples from new music and sound, from artists and recordists currently working. Therefore works based entirely on archival or antique sound will be given less consideration than those based on samples from currently practicing artists releasing on netlabels. Each and every single sample you use must be credited. 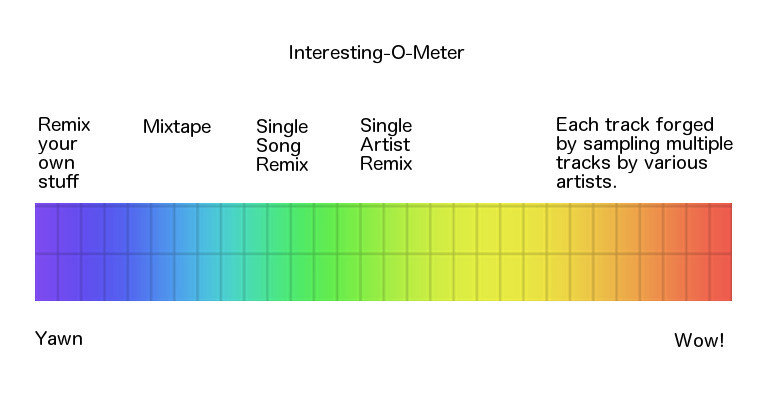 You should provide attribution for every sample, and for each individual track on your album, assuming each track is based on different samples. Submissions without this information will not be considered, since in that case there would be no way for me to determine if the work is appropriate for this label. Many, but not all netlabels support deriv-friendly licenses. If you’re looking for work that allows for derivs, there are many resources available, perhaps the best of these is the website the Easy Pace. This site continually updates with notices of new netlabel releases, including the license information. Another, perhaps more labor-intensive method would be to search the comprehensive netlabel list compiled by Acts of Silence, and browse titles that way. One goal of this netlabel is to shine a light on netlabels that primarily support deriv-friendly licenses. I’ve only started this label in 2013, and I’ve begun compiling a list of these labels. My list may not be very large, and makes no claim to be comprehensive. With that caveat, you can also take a look at the links page I have set up. There is no requirement of being within any specific stylistic boundaries. I personally am more interested in experimental and drone work than beat-based or rock-based music, but these tastes of mine do not apply to the mission of this netlabel. I respect all work that could be done within the constraints I’ve laid out. I personally am very interested in deeply transformative work that completely changes the characteristic of the original source, but that is not the only focus of this netlabel. Collage/paste-up work is also transformative due to its recontextualization of the source material, and so either approach is valid here.